January 25th 2017, Bildmuseet, Umeå. As a warm up for the PhD defense of Jeroen Peeters, Anna Croon and Ambra Trotto have chaired a research panel, hosting John Zimmerman from Carnegie Mellon University (CMU), Caroline Hummels, from Eindhoven University of Technology (TU/e) and Heather Wiltse, Umeå Institute of Design (UID). Contemporary shifts in society, technology and manufacturing urge the reframing of design processes, approaches and tools. 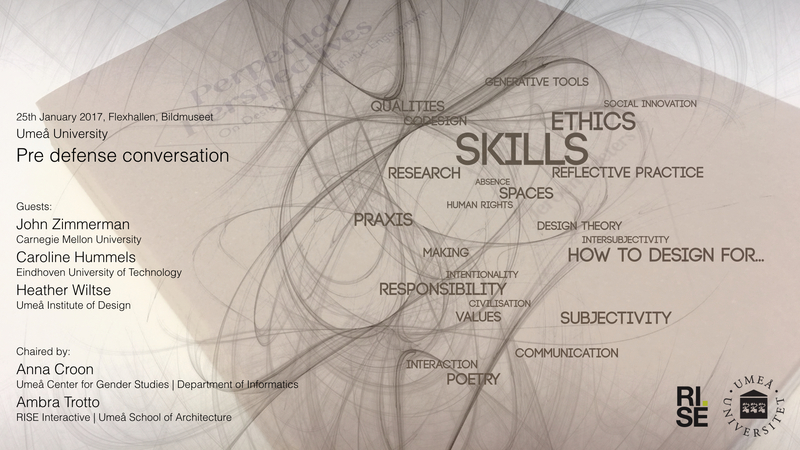 These shifts implies a transformation of design education, research and practice. This in turn expands the scope, boundaries and uses as well as the strength to tackle societal, technological and industrial needs and demands. During this panel we will explore alternative forms of knowledge production offered by design theory, research and practice. Of special interest are issues that involve local knowledge, social learning, designedly ways of knowing, transformation of knowledge, society and technology. We depart from the invited speakers’ experiences and research practices to set the stage for a discussion. The panel aims at exploring situations and examples that support and focus on composition, reflective critical practices and research through design. The stance of the panel is that knowledge production within a designedly framework needs to be understood as reality producing processes enabled by and distributed in material as well as collective practices in which human and non-human actors are co-present. Questions addressed are among others: What goes on in the world of design, where practitioners use their hands, bodies, tactile and sensory apparatus to create things? How is design research contributing to knowledge-making and future (reality) -making? How do we make an impact and where?